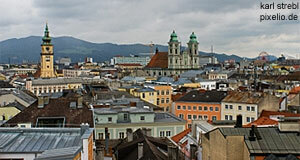 Linz is the capital of the province Upper Austria and only about an hour by train from Salzburg. Historically, Linz has been a industrial hub and the steel factories, the large station and other big factories still shape the city. However, at least environmental issues are considered these days and in recent years, Linz took great efforts to rise to one of Austria′s most vibrant cultural cities. Among the highlights are a number of re-modelled or new museums, such as the Nordico Museum or the Lentos Art Museum. The most significant sign that Linz aims to be a place with a bright future is the "Centre Ars Electronica", which is described to be a "museum of the future". It is dedicated to IT and electronics in a range of non-technical aspects. It presents electronic art and music as much as the influence of high technology on the individual′s life. By any means, the Ars Electronica is among Linz′ top-attractions. Historic sights include the main square Hauptplatz with the Dreifaltigkeitssäule ("Trinity Pillar"). This is a Baroque pillar similar to an obelisk. It was built by the Salzburg artist Stumpfegger who is buried on St. Peter′s Cemetery alongside with his seven wives. Furthermore, there is the Pöstlingberkirche Church, the Alter Dom Cathedral and the Neuer Dom Cathedral and the Jesuitenkirche Church, all historic churches worth at least a short visit. The Linzer Schloss Castle is located on the Schlossberg Mountain and hosts a museum and art gallery as well as changing exhibitions with various topics ranging from art to ethnology or history. Generally, they are of high quality. For a few moments in almost rural tranquility, go to the Donaupark along the Danube River. Here you will find some sculptures, cycling paths and picnic areas. An even more drastic escape from the city centre is a trip to the Pöstlingberg Mountain. A small railway takes you up this scenic hill. On the top there is a fairy tale trail ("Grottenbahn") with a miniature train that will cause great excitement if you travel with small children. Half way down the Pöstlingberg you will also find a small zoo, not the most exciting zoo in Austria, but if you are there already, you might want to go. Trains to Linz depart from Salzburg frequently, on weekdays probably every hour. The fastest connection are "Intercity" trains. Information on Linz and connections from Salzburg is available at Salzburg′s central station and the tourist information centre.